Two local footballers will line out for the Northern Ireland senior ladies team this week. Coleraine pair Chloe McCarron (17) and Lauren Wade (21), will line out for Alfie Wylie side at the Istra Women’s Cup in Croatia. The talented local pair will play three games, against hosts Croatia, Romania and Poland. The tournament welcomes teams from across Europe and will be a good challenge for the local girls. Lauren, a sports student at Jordanstown University, plays her club football at Glentoran. She is no stranger to the senior side having gained her first senior cap against Scotland when she was just fifteen. 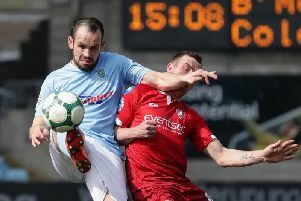 The winger has eight senior Northern Ireland caps. For Chloe this is only her second call up to the senior side. The Coleraine College pupil who plays her club football at Mid Ulster Ladies is delighted to have been included in the squad.